Sopa de ajo is a wonderful soup, originally made with just garlic, bread and water. It has been adapted over time to include a rich broth, egg, spices and occasionally ham. I love making this soup when everyone around me seems to have the sniffles. It also cures a sore throat fast! My version does not include croutons or ham, so it is not very traditional. Instead, I use roasted asparagus because I think they go so well will eggs and add some extra vitamins, namely vitamin K, folate, vitamin C and vitamin A. There are so many germ fighters in this soup–broth, egg, garlic, cayenne and chives. This recipe makes four healing bowls of soup. To prepare soup, heat remaining 1 tablespoon olive oil in a large saucepan over medium heat. Add minced garlic; sauté 1 minute, ensuring the garlic does not burn. Add the paprika, cayenne and cumin and sauté for 30 seconds. Stir in broth and bring to a boil. Sprinkle in some sea salt and fresh ground pepper. Cover, reduce heat and simmer 20 minutes. Ensure your oven is still at 450°. Break 1 egg into each of 4 ovenproof bowls. Divide the broth mixture evenly among bowls. Place bowls on a baking sheet and bake for 15 minutes or until the eggs are set. Remove from oven and top each serving with roasted asparagus and chopped chives. Sprinkle with extra salt and pepper to taste. 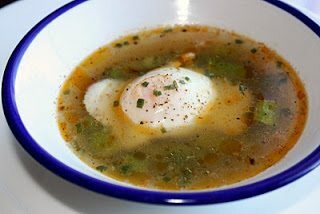 It's a beautiful broth and I would so enjoy breaking that yolk! 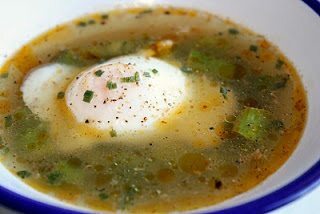 Excellent soup, I love the asparagus and the egg in in! I love that poached….egg. Heaven with fingers of toast…..hmmmm! I could slurp that up right now! Can you post printable recipes? I love the egg in this! Looks so inviting. I love how this soup has an egg floating in it…that must be so delicious! I am always looking for new soups to try, thanks! You sold me with the picture of the egg in soup – always brings thoughts of comfort. Love the simplicity but strong healing power of this! Will keep it in mind next time I'm feeling under the weather!